Grant applications for FY 2019 open on September 1st. The window to apply is ONLY 6 WEEKS – so don’t delay and start thinking about your project now. 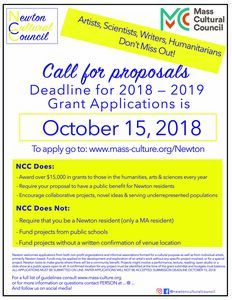 All grant applications must be completed online via the Mass Culture website (the link will be available on their site starting September 1st). Next PostNext The Countdown is on!